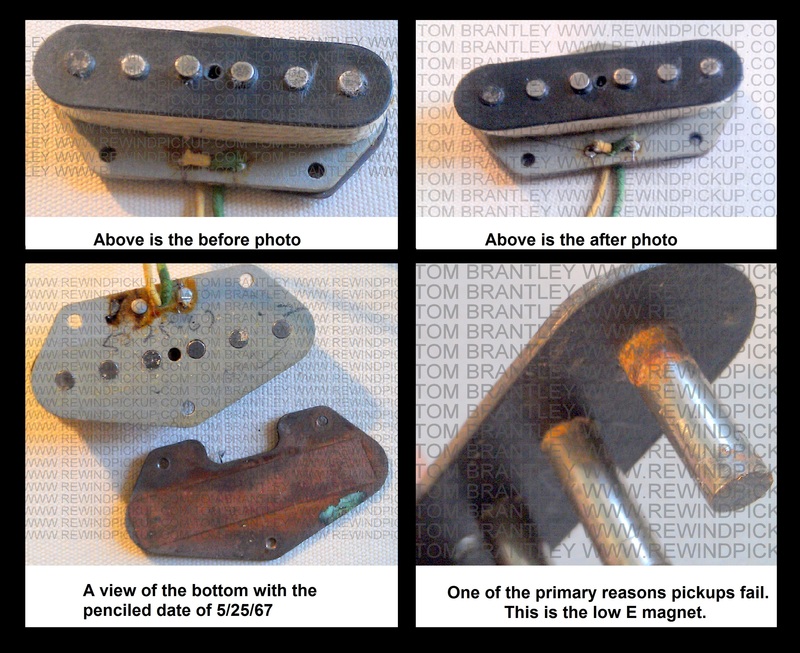 Most Fender style single coil pickups will be $60.00. All efforts will be made to repair before rewinding. The process begins with a check of the magnetic field. The leads will then be verified for continuity. The coil will now be measured to see what, if any, reading is available. If no reading, the solder joints are re-flowed and a check for continuity. At this point, I will use a fine brush to determine if there is a break in the exterior winding. If no break is found, the end of the exterior winding will be removed and unwinding will begin. Generally, no more than 500-700 turns will be removed. If no break in winding is found and rust is evident on the poles it is safe to assume that corrosion has invaded the coil and broken down the insulation on the winding wire and compromised it. A full break down, cleaning, and re-assembly will now begin. The bobbin will be re-assembled to original specs and any visible surfaces will be left to appear as original. The magnets will be isolated with a coat of lacquer. The coil will now be rewound in the manner it was done originally..either machine or hand wound. When winding is completed the coil will be wax potted, lacquer potted, or left un-potted depending on customer preference and desire for originality. The pickup will be done in such a manner as to make repair or rewinding almost unnoticeable.